Etiology: Barbering usually occurs when a dominant guinea pig chews the hair of other subordinate guinea pigs in the cage. Self-barbering may also occur if an animal is experiencing stress. Incidence: The incidence of barbering is moderate. 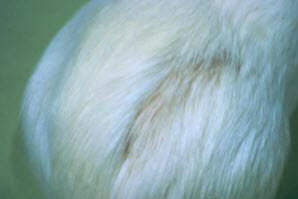 Clinical Signs: Clinical signs include patchy hair loss and presence of broken hair shafts usually without bite marks or skin inflammation. Alopecia in the flank region indicates self-barbering . Diagnosis: Diagnosis is made based on clinical signs and history, and by ruling out other underlying conditions, especially ectoparasitism.